To get to work at Flinders University, I normally go through the Warriparinga Wetlands and go under South Road using the bike track along the creek. However, during the first stages of the duplication of the Southern Expressway (our rather unusual but effective one-way direction-reversing freeway), it is not possible to go that way, because the path through the wetlands under the expressway is closed. 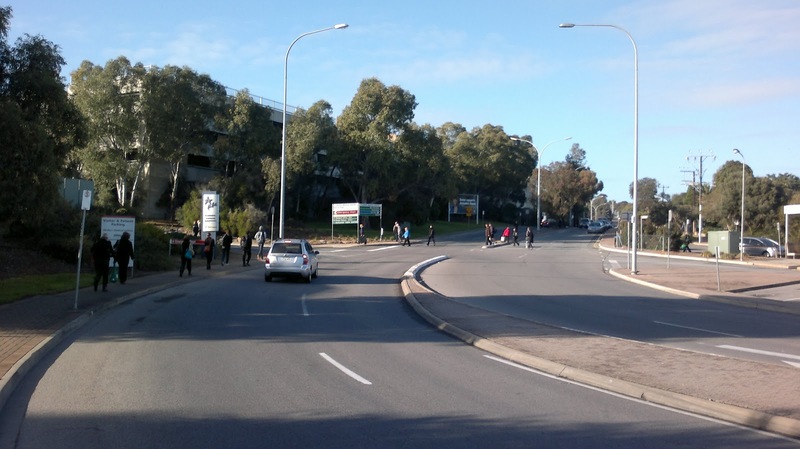 The next best route is to go part way through the wetlands and come out at the intersection of South Road and Flinders Drive, and ride up Flinders Drive to the University. In documenting this intersection, my concern is not just for bakfiets riders, but for the hospital staff who use this intersection. Unfortunately, that intersection is not really set up for the level of pedestrian traffic it gets now that the hospital has a staff car park behind the old Sizzler Restaurant. 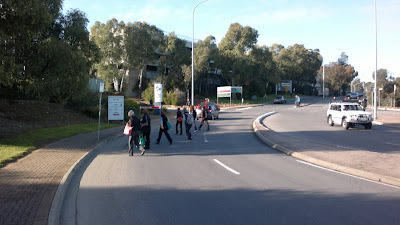 Often 20 or more people are waiting at the pedestrian crossing at a time. There are several problems, not just for someone riding a bakfiets. Problem 1 - Tiny Refuge. The refuge in the middle of South Road is too small to fit this many people (and too narrow to fit a bakfiets at all), and both sides do not always go green at the same time for pedestrians, so it is possible to get stuck in the middle with no room. Not fun when it happens, especially at night or in the rain. Tiny refuge in the middle of a very wide busy road, too small to fit all the people who might cross at once. Problem 2 - The pedestrian crossing is on the wrong side of the intersection. Practically all of the people want to get to the Flinders Medical Centre. So they walk across the pedestrian crossing, and then all just fan out across Flinders Drive, which initially has no traffic on it due to the traffic phase. While obviously silly, the location of the pedestrian crossing encourages it, and the lack of a sufficiently sized refuge on the eastern side of the intersection means that it isn't safe to wait there, either. We really should do something to protect the lives of our hospital workers who do so much to protect and care for all of us. 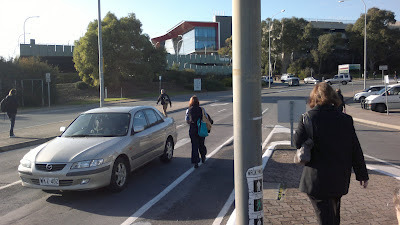 The following frames show the migration one morning, complete with pedestrians oblivious to cars coming around onto Flinders Drive from South Road. This is a fairly common site at this intersection in the mornings. Problem 3 - You have to cross both roads, because the pedestrian maze by the hospital is too tight, and the back streets have near-vertical bits. 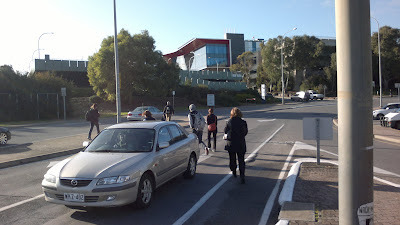 Because the pedestrian crossing lands on the wrong side of Flinders Drive, you either have to cross Flinders Drive so that you can ride up it, or go up Rupert Street, the little side road on the south-west side of Flinders Drive. However, once on Rupert Street, there is no way you can get a bakfiets back onto Flinders Drive: your two apparent choices are the pedestrian maze between Flinders Drive and Rupert Street, which is too tight, or to proceed up Francis Street to the slip lane onto Flinders Drive, which requires riding up a very steep piece of road, which would be practically impossible on a bakfiets. 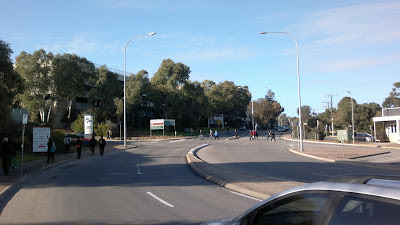 So the best solution is to aim carefully when crossing South Road so that you can manoever the bakfiets into the tiny refuge island, and then cross Flinders Drive when the signals let you, and then ride up Flinders Drive, dodging the migratory hospital workers, who have long since got fed up with doing the same. It seems that all of these problems might be able to be addressed by moving the pedestrian crossing from the southern side to the northern side. 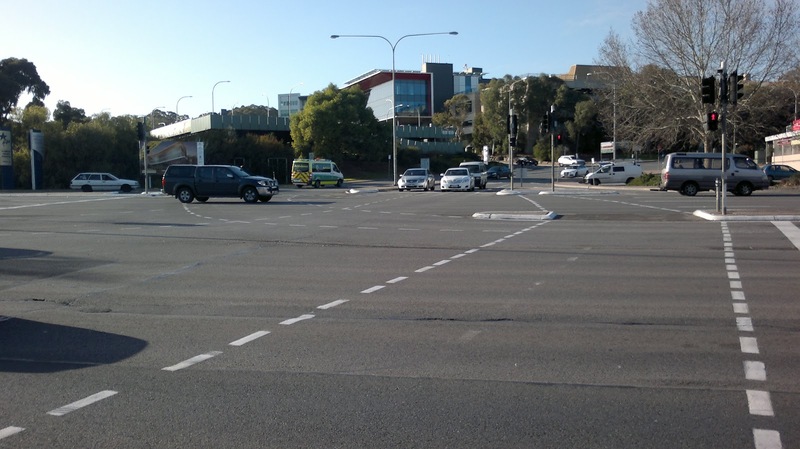 First, the median strip there is about 7-metres wide instead of the metre and a bit on the southern side of the intersection. Much more room to fit the migrating hospital workers, and to keep people safe if they are stuck waiting for the next cycle. 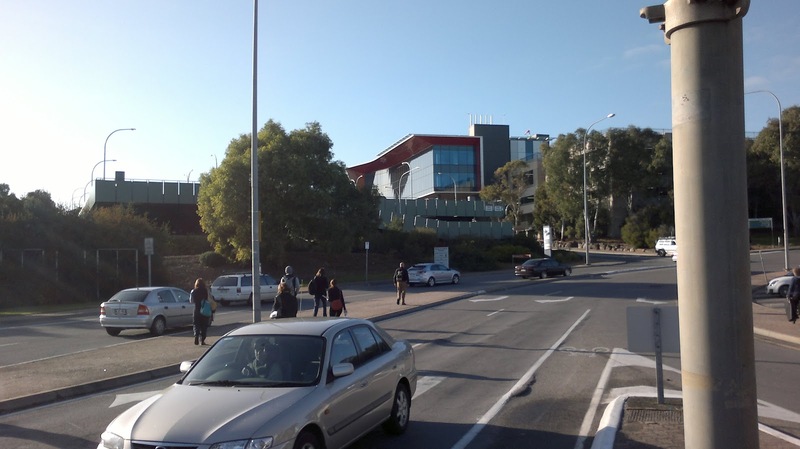 Second, it avoids the need to cross Flinders Drive at all, and will thus avoid the motivation for pedestrians to wander haphazardly across the road. Third, it avoids the tiny waiting area at the south-eastern corner. The downside would be some interference with the traffic flow along South Road, which is presumably why they put the pedestrian crossing on that side to begin with. However, that was before there was a busy hospital car park. Meanwhile, beware of wandering pedestrians, the lack of a usable refuge island in the middle of the road, and a tiny waiting area on the eastern side of the road, and the futility of taking Rupert Street to avoid these problems.